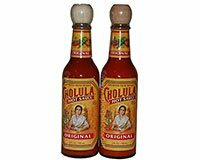 Set of 2 x 5 ounce bottles of Original Cholula Hot Sauce. Authentic Mexican Hot Sauce. Cholula Hot Sauce makes your south of the border culinary adventures full of Flavor, Fire and Fun! Add garlic and shrimp. Turn occasionally. Stir in tequila, lime juice, salt and Cholula. Cook until most of the liquid has evaporated and shrimp is pink (about 2 minutes). Add cilantro and serve over hot rice. Cut each avocado in half, remove the skin, and scoop the avocado out of the skin. Place in a bowl. Add rest of ingredients and using a fork, mash and mix to desired texture. Cover and chill in refrigerator for 1 hour. Serve with tortilla chips or other entrees. Combine the rub ingredients in a bowl. Rub on both sides of meat. Refrigerate and let marinate for at least 30 minutes. Grill marinated carne to your liking. Remove meat from grill. Let sit for 5 minutes and then slice to your desired thickness. On each tostada, spread 1/2 cup lettuce, top with 1/2 cup warm refried beans, carne asada strips, 2 slices of avocado, a dollop of sour cream and a little cilantro. Place ingredients in a blender and blend well. Rim glass with celery salt. Fill 7oz glass with ice. Pour 5oz Bloody Maria Pre-mix over ice. Top with 1 1/2oz Jose Cuervo Tradicional Tequila. Garnesh with a celery stick. Drink responsibly.